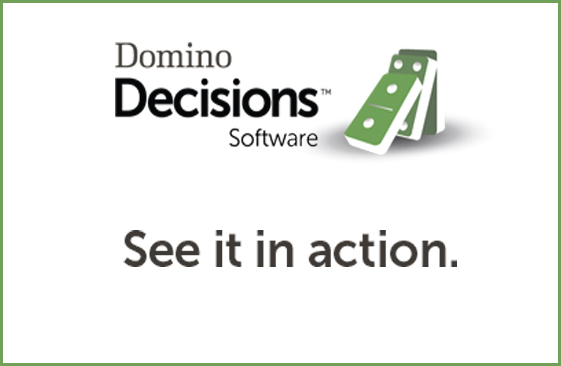 Domino Decisions Professional Services ensure client success with Domino Decisions™. Professional Services includes implementation, training, and assistance with data management, reporting, and other key functions. Domino Decisions Professional Services help ensure that the platform delivers maximum value while minimizing the time and resources required for both implementation and ongoing marketing management. The Domino Decisions Implementation process is built from our real-life experiences as business professionals, implementation consultants, and software clients. Implementation is pragmatic, so you achieve full benefits as quickly as possible. No more scrambling to assemble reports from disparate data sources. Get integrated marketing performance insights that will allow you to fine-tune your marketing plans. Interpretation of reports – what is the data telling us? Few marketers look forward to planning season… when your focus is diverted to researching costs, building calendars and budgets, presenting the plan, and getting it approved. The Professional Services team leverages the power of Domino Decisions to make planning faster, easier, and more robust – while you and your team stay focused. Multiple scenarios as required to test marketing mix, weight, etc. Download our Professional Services Brochure to learn more!